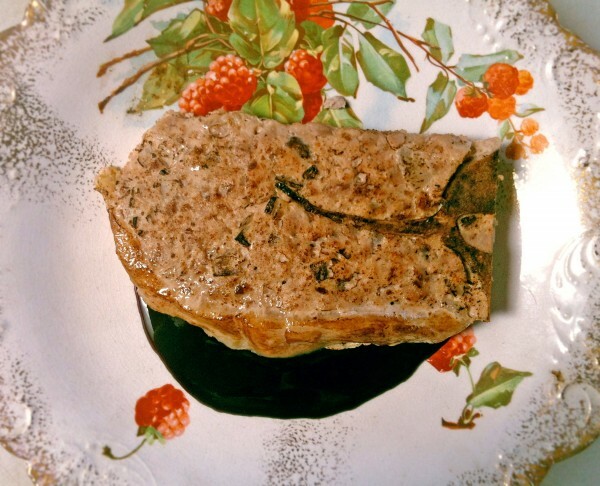 Escoffier recipe for making ground pork chops, côtes de porc grand’mère, at home (Escoffier, 2922). Pork chops even Grandma can chew! This is an interesting way to deconstruct and reconstruct pork cutlets. If you have a particularly tough piece of meat you could use this technique to render it deliciously tender. The French word ‘côtes’ generally refers to ribs today, but this recipe in the English translation of Escoffier’s book uses ‘côtes de porc’ to describe pork chops, or cutlets ‘côtelettes’. Start with four pork chops, or bone-in cutlets. 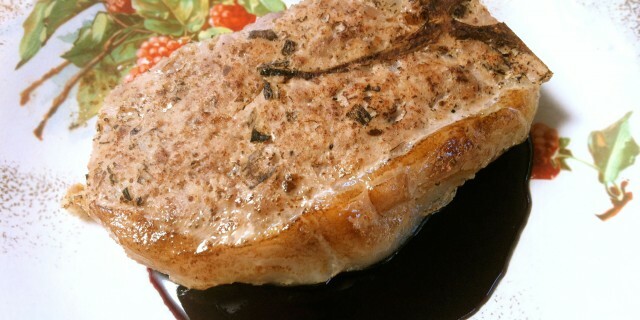 You can use any cut of pork chop, of which there are several. Trim off the edge fat (the long strip of fat usually on one side of the cutlet) in one piece and reserve. Debone the cutlet and roughly chop. Refrigerate the meat. Reserve the bones. 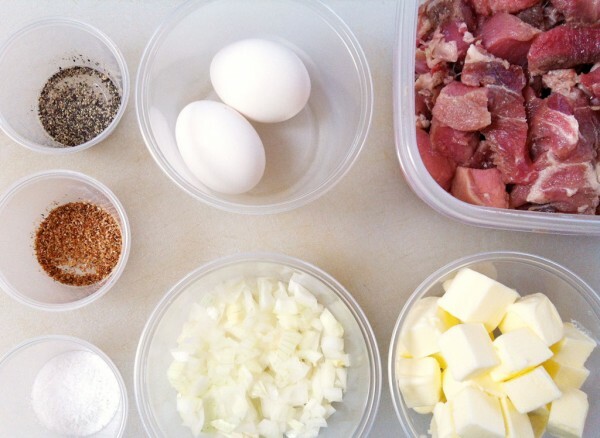 Grind the pork in a meat grinder and immediately refrigerate. 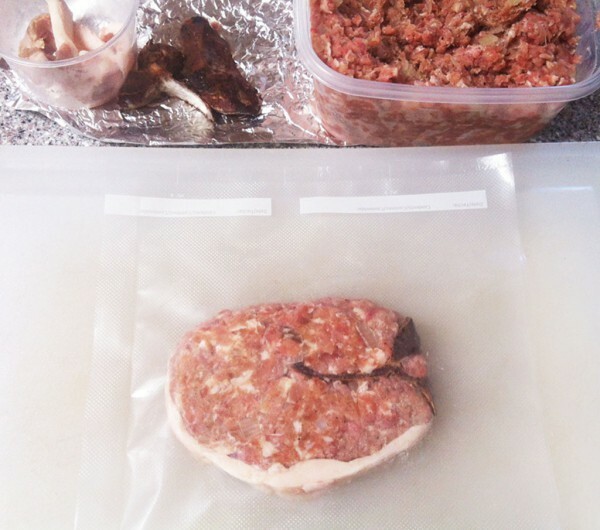 Cooling the meat before and after grinding helps prevent the fat from melting, and makes for a nicer ground. 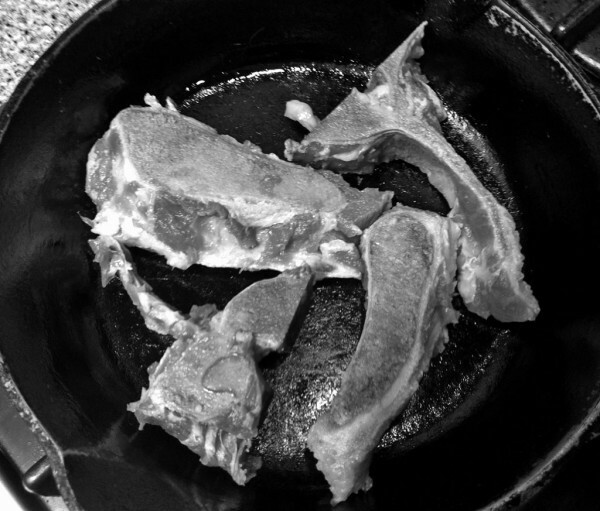 Brown the bones in a skillet. 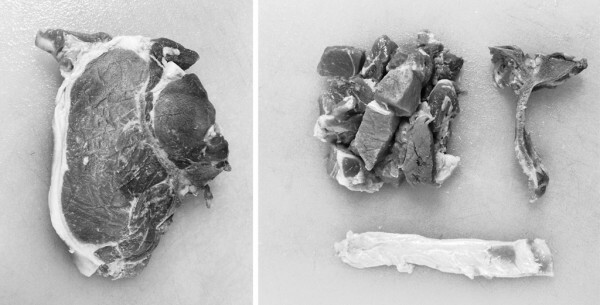 Clean off any meat or fat remaining on the bones. Drain on paper towels and reserve. This is optional, but we think it looks better when the dish is completed. 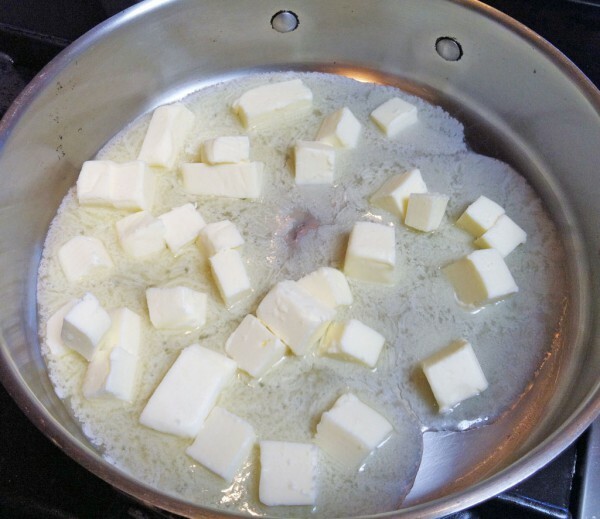 Melt the butter in a saucepan on medium heat until it foams. 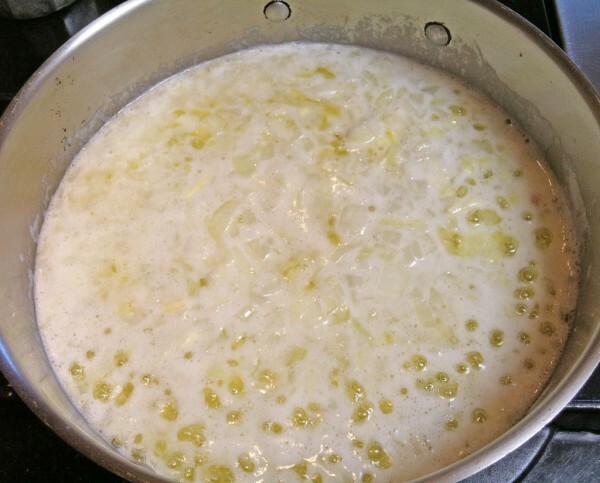 Gently sauté the diced onions in the butter until cooked – translucent but not browned. Remove and let cool to room temperature. Combine an egg, the sautéed onion, butter, salt, pepper and ground nutmeg with the chilled ground pork. On a clean cutting board, reform eight ounces of the pork back into a cutlet, adding one of the bones and edging it with a strip of fat. 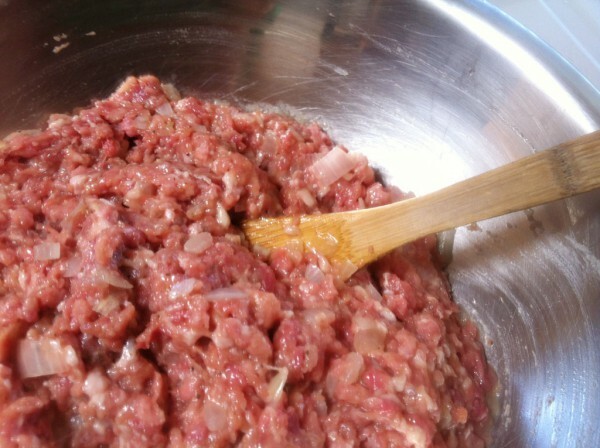 Repeat for the remainder of ground pork. 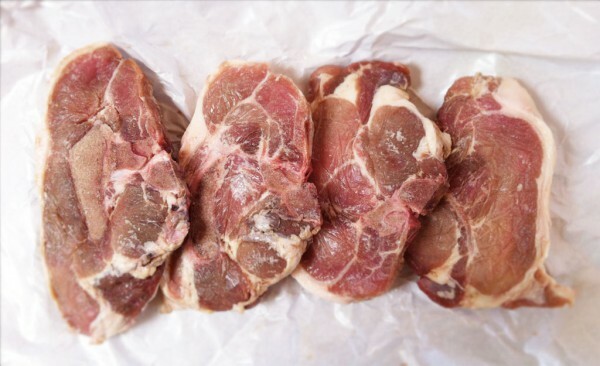 So you end up with four côtes (or ‘cutlets’) of pork. 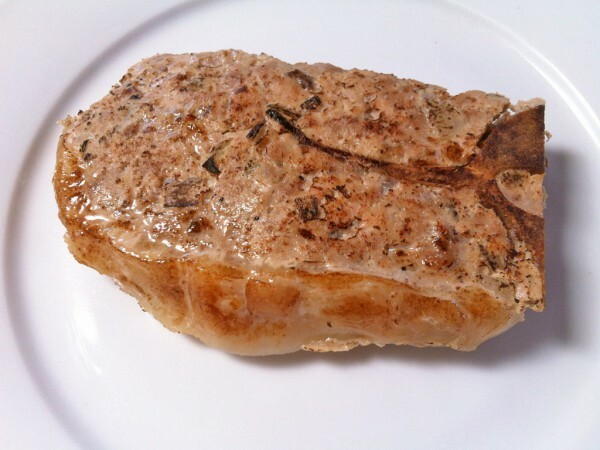 The Escoffier recipes now says to wrap the assembled cutlet in caul fat, and bake in an oven. If you have any caul fat, go for it! We tried pan frying without the caulfat enclosure, but the cutlet fell apart from all that butter. 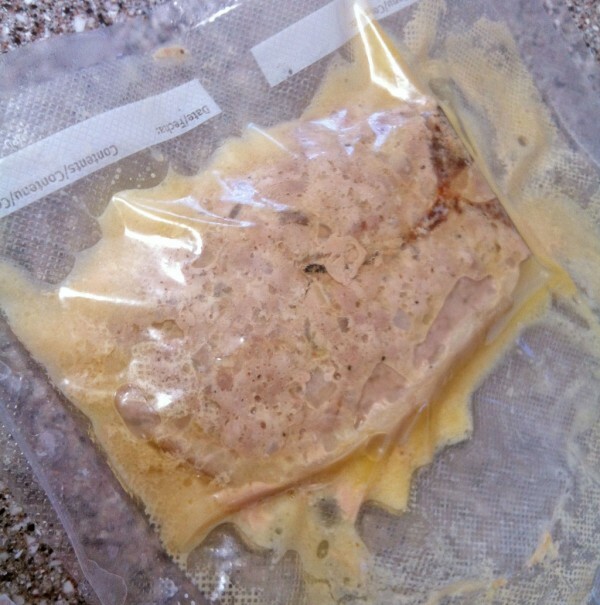 So we sealed ours in vacuum bags and cooked en sous vide for 20 minutes at 65ºC in a SousVide Supreme water oven. After they were done, we removed them from the water bath and plunged into a cold icewater bath. The high setting of the vacuum held the cutlets in shape while they cooked, and the collagens in the meat provided a natural binder. Sear the cutlet for final plating. Grandmother’s pork chops (Escoffier 2922), served with a cherry reduction. Tramadol Cheapest Yields: Enough for 4-6 pork cutlets, or up to 8 burgers. Remove the meat from the cutlet bones, chop it finely and add per 500 g (l lb 2 oz) of meat, 100 g (3 1/2 oz) butter, 50 g (2 oz) chopped onion, cooked in butter without colour, 1 egg, salt, pepper and a touch of grated nutmeg. Mix these ingredients well together. Mould the mixture to the shape of cutlets and attach one of the cutlet bones to the side of each. Wrap in a piece of pig’s caul, sprinkle with butter and grill them gently. Arrange in a circle on a dish and serve accompanied with a dish of mashed potatoes.